Today was a very odd day at work. I often feel like I'm being filmed by a hidden TV camera and the goal is "How crazy can people act before she realizes this is all a joke?" Came in at 8:45 am - crisp morning that was warming up. Started off sunny but clouds were rolling in. It's been two weeks being behind the register and I still love it. I love having the ability to glimpse inside peoples kitchens, inside their lives. Doritios, Fritos, Cheetos, soda, sour cream and onion dip; these customers have parties or friends over often. Probably fun people. Go-gurts, snack pacs, Gatorade - sports players in the family. Organic chicken, organic carrots, organic broccoli crowns, organic wild rice - probably intellectually influenced. And live too far from Whole Foods. I love when moms (most often it's moms, sometimes dads) come in and buy 300.00 worth of groceries. Pancake mixes! Chocolate Chip nestle morsels! Ice cream! Cereal! Waffles! Hamburger meat, chicken, bacon, potatoes...this is a family where one parent is lucky enough to stay home. Where the mom makes dinners, breakfast, dessert. Rushes home to be there when her kids get home from school. There are often coupons involved and the mom's eyes light up when she realizes how much money she has saved the family because she has been diligent (I love when they save money too). When I was a paramedic I loved a glimpse of life into my patients homes. So little could tell me so much. But that's for another story. I have a feeling I'm one of the few people that think like I do. But I've noticed that people look at me as if they feel sad for me when I tell them I'm a cashier at a grocery store. I'm sure they think, "So much talent, WASTED on a boring job." Don't feel sad for me. I love it. I like to think about the families gathered around together eating. Or the single man making his chicken nachos while watching a football game, or the old couple enjoying a cup of soup while they read the paper. I love to see the new food that comes out - Rice Crispy Oreos! Pumpkin Spiced Keebler cookies! Things I would never think to look for. I love seeing the creativeness of food - and the people willing to try new stuff. And I admire the customers who stick to the tried and true - there's something comforting about green beans and water chestnuts and French onions. The people I work with may be an odd lot, some of the customers a bit crazy, but this being a cashier is very similar to being a medic - a brief encounter into the life of people. As a medic I tried to make them better. As a cashier, I smile and genuinely ask, "How are you today?" and I mean it. It's not something I say because the company wants me to, it's because I mean it. If you want to make small talk with me, I'm more than happy to engage in conversation. Because I still believe people matter. Kindness matters. Caring matters. People are fascinating. We all have stories to tell...and I love the stories that people tell as I place their bananas on the scale, as I scan the cake flour, the apples, the brown sugar, and the eggs. Wasting my time as a cashier? Nah. I may not have a seat in the front row of life like I did when I was a paramedic, but now I have something better: a window seat! Instead of worrying about getting stuck with a dirty needle, I only have to worry about getting chicken juice on my hand. I don't have to worry about how I'm going to carry a large person down three flights of stairs...I only have to worry how I'm going to pile all the bags of groceries into the customers cart. I love my window seat. I love the glimpse I have into what comforts people, what brings people together (roast beef, baking potatoes, rolls, apple pie), and how people celebrate (soda, cake, ice cream, chips, cookies). What they eat when their alone (frozen dinners). What they eat when they are studying (Red Bull and potato chips). What they eat when they are going on a road trip to a wedding (Goldfish crackers, muffins, Twizzlers). What they buy for the anniversary of the death of their spouses (flowers). I only work four hour shifts, which is perfect. Because as much as I love what I do, by the end of my hour hours, I've had enough of making chit-chat. Just because I generally like people, doesn't mean I want to be around them all the time. At the end of my four hours, I'm eager to purchase those Rice Krispy Oreos and escape home, where I can eat my cookies (which are fabulous by the way), sip my coffee (or wine, depending on the scale of crazy my day was), and reflect on the personalities I've met; the nice people, the mean people, the barely getting by people, and the rich people - all telling me their stories through the food they choose. Nope, don't feel sorry for me. Feel sorry for those cashiers that think their job is boring - they haven't yet figured out that it's a psychology/sociology/marketing class they are getting paid to attend. I recently read Anything For A Vote by Joseph Cummins is a great example of an author who claims to be unbiased, yet...an informed reader can easily pick out where Mr. Cummins leans and the hidden liberal influence weaved throughout this book. Get Clued! Read the Washington Times. Read the New York Times. Read Washington Post! J.C. gives Bill Clinton credit for balancing the budget and for revamping welfare. He barely brings up all of Clinton's affairs and glosses over Lewinsky in one sentence! Cummins states John Kerry was a war hero. Cummins of course, brings up Palin's gaffes, however, compared to Obama stating he visited 57 States? He didn't even mention that. He didn't mention Obama referring to Hawaii as being in Asia. Nor did he refer to any of Biden's Gaffes . That said, it is an interesting book and it's a bit of a relief to realize that mud-slinging is nothing new. However, when 99% of media and culture is constantly favoring Democrats and belittling people to the right, it influences those who still believe that mainstream is intellectual when in reality, they are pandering pimps who only care about their power & status, not the success of the individual. Anything For A Vote By Joseph Cummins rates a 6 on the Liberal Influence scale. If you are looking for a truly inspirational movie - rent (or buy!) Above and Beyond. I am not Jewish. Well, maybe. I could be. My mom was adopted so I could be Jewish. Or black. Or both. Anyway, I grew up primarily in the mid-west and Jews were not talked about like they are on the east coast. I was very fortunate that where I grew up was very blue collar and very open and accepting of all. Or maybe I just grew up in a time where TV was not really full of mind numbing, character corrupting, division eliciting, programming. It wasn't until I moved to Pennsylvania after highschool and had lived here for some time when animosity toward Jews popped up. I'd hear people making fun of Jews for being cheap, tight, always liking a bargain. Which, I am all those things. I really never knew or understood the history of Jews until I started paying attention to politics. I couldn't understand why so many in leadership positions in the USA did not seem to stand with Bibi Netanyahu. I feel he is a strong leader who really does love and care for Israel. II admire the Jews for all they've gone through and for their propensity to run TOWARD a threat instead of away from a threat. 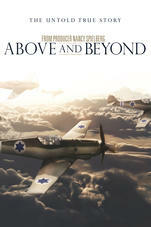 One day I happened upon the movie "Above and Beyond" - it's the story of how WWII Jewish Vets from the United States risked their citizenship to become the first Israel airforce in 1948 for the War Of Independence. The movie is inspiring. The creative courage and self determination of so many people beat the odds. It was such a great movie, a great story, I'm thinking I might add a new tattoo (and I swore I'd only ever have one): The Angel Of Death. The Angel of Death is the logo that was hurriedly created (on a napkin!) in a Tel Aviv bar for the 101 Squadron unit of the Israeli Air Force. The design is still on Israeli F-16 jets today. Above and Beyond is an uplifting movie. It tells the story of courage, pride, creativity, and freedom. And it does so in such and entertaining way, I watched it twice in one week! As you know, I was a great fan of Honor Flight since seeing the documentary about it a few years ago. Honor Flight started as a non-profit organization that sent WWII Vets and chaperons to Washington DC to see the military monuments dedicated to our Veterans. What made Honor Flight different from every other non-profit, was that they were going to end the non-profit after their goal was met and they'd gotten all the remaining WWII Vets on the flight. Not many are left, unfortunately. They talked about this in the documentary and I thought is was a brilliant idea! I loved that aspect of Honor Flight. It had a single purpose. It wouldn't morph into a 'business' under the guise of a non-profit as so many well intended non-profits have done. Imagine my surprise when I noticed Honor Flight changed to include not only WWII Vets, but also Korea and Vietnam Vets. So, in essence, it has morphed into a non-profit similar to most - no ending. What made Honor Flight so special was the inclusiveness. The response I received was that they do not give out the names. This is extremely disappointing. How do I know my donation is going to a VET and not the salary of an employee? I'd love the opportunity to get to know the VET and it would make great PR for Honor Flight to connect the person who donates to the veteran who is going to receive it. There is an Honor Flight Charter on Tuesday, October 5th leaving from the Parx Casino. It's hard to find the information for this, unfortunately. What I found can be found here: https://honorflightphiladelphia.org/tour-of-honor-october-5-2015/ - however, there is no information about the homecoming activity (what time should we arrive? Where should we go?) - I'm a bit - no, I'm a lot disappointed. I hope they are able to get their act together and make it easy for Vets and for those who want to help to do so. A cozy, magical, romantic Christmas book!